When you talk about a mens topaz gem stone wedding ring, the first thought that comes to mind is a blue topaz gem stone. The fact is that, most people think only of blue topaz stones when referring to a mens topaz ring. 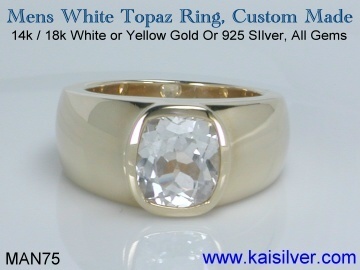 The MAN75 Kai Silver white topaz ring for men, has started to make a difference. This hefty and durable mens wedding ring with white topaz has proved that, white (colorless) gems need not be drab or boring. Available as a gold or 925 silver mens topaz wedding ring, the jewel is shown here in yellow gold. There is no doubt that the rising price of gold has, pushed even seasoned jewelry buyers towards silver. 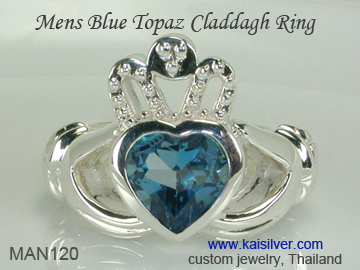 When it comes to a sterling silver mens topaz ring, you can find no jeweler better than Kaisilver. Our commitment to craft quality jewelry in gold or 925 silver, is nothing new. We have always welcomed both metal options for all the jewelry that we make. While most jewelers give secondary importance to silver jewelry, we dedicate the same resources related to design, craftsmanship and gem stones to both gold and silver jewelry. This is something that no other jeweler can claim to do, and this is precisely what makes us the preferred source for both gold and silver jewelry. The MAN75 white topaz ring for men is set with an eye clean natural white topaz gemstone. The bright sparkle of the gem is the focus of the gem, this ring can be custom made with a white or blue topaz gemstone in 925 silver or gold ... more. The deeper meaning of the legendary claddagh ring makes the jewel perfect, for a wedding or engagement. Kaisilver is accepted to be the best source for high end custom cladagh rings, choose white or blue topaz for this awesome ring ... more. To begin our discussion on the MAN75 Kaisilver white topaz mens wedding ring, we will highlight the essential features of this jewel. We will not get into sales talk, as the impressive style and design of this men's topaz ring speaks for itself. Before you start comparing the price of this white topaz wedding ring for men with other jewels, take a moment to understand the advanced features incorporated into this high end jewel. While you remain impressed with this awesome ring, we have built in features to work quietly in the background. Most jewelers would have made a similar jewel with a gold or silver weight of around 10 to 12 grams. We have invested more than 20 grams of metal into the design and construction of this jewel. In most cases, your white topaz men's wedding ring would weigh at least 25 grams. The handsome metal weight adds to the longterm durability of the jewel. Having said that we do know that, metal weight is not the only factor that decides the durability of a jewel - so we have been proactive, and added many such features. We will say a little more about the researched design, on which this mens topaz wedding ring is based. The fact that the metal weight in gold or silver, is kept proportionate to the ring dimensions and sizes means that, the metal thickness is sufficient to ensure that the ring retains shape and form. This might seem like something very simple and common but, the facts are a bit different. When we said that most other jewelers would make a similar ring with half the weight that Kaisilver provides, we have made a very important statement. When you keep the dimensions and size of your ring constant but, reduce the metal weight - the ring becomes quite thin. This would ofcourse make your ring prone to denting and deforming. Now turn to the gem stone mounting on this white topaz gem stone mens ring, it is bordered all around with metal (gold or silver). While this is a neat and streamlined gem mount, using prongs would have made the task of gem mounting much easier. We do know all about prong settings for mounting a gem, that is precisely the reason why we avoid using prongs. Had we used prongs to set the white topaz gem stone in this mens ring, the prongs could have got stuck to the fabric in the pockets etc. When this happens, the prongs get pulled and gradually loosen. This could ultimately result in the gem becoming loose and probably even falling out of the mounting. It is therefore clear that the gem border type of mounting, that is shown in the MAN75 ring here, is ideally suited for sturdy gem mounting. We will now discuss one of the most important features of this mens wedding ring, the gemstone. Like all Kaisilver jewelry this men's wedding topaz ring, can be custom made with the gem stone of your choice. Let us first talk about the white topaz gemstone in the MAN75 ring. This is a natural topaz gemstone, and is mined in a few nations like, Nigeria, Brazil and even Sri Lanka. We procure our gems directly from the mining sites, infact quite close to the mining pits. The idea is to ensure that we get to pick the best stones. Our gem experts can evaluate the suitability of a gemstone for cutting and polishing, by inspecting the rough stone. Only eye clean white topaz is selected for making the gold or 925 silver white topaz men's wedding ring. The perfectly angled and cut facets hold just enough light to throw up a brilliant glitter. A slight error in calculating the number of facets or the length of each facet, can ruin the entire gemstone. Our skilled cutters have custom cut more than a hundred thousand gems until now, they know the right orientation, facets and angles that every gem on this planet needs to look great. The durability of this jewel was given special importance, topaz has good durability and is ideally suited for mens rings. We realize that your mens topaz wedding ring is a very special jewel, you want it to stay in shape for a long time to come. The fact is that men take far less care of the jewelry that they wear as compared to ladies. Topaz gems rate a handsome 8 on the Mohs hardness scale that, goes from 1 (least) to 10 (maximum). This along with the other durability ensuring features built into this white topaz men's ring, go a long way in ensuring that your ring stays in shape. Hefty metal weight 20 to 25 grams. Sturdy gem mounting, metal all aroud gem. Metal border for gem protects gemstone. Gemstone does not protrude too much. Good band width even behind finger (min 5mm). Available in 14k or 18k white or yellow gold. Sterling silver option, with or without plating available. Sky blue, swiss blue and london blue topaz also available. All gem options, gem cut options too. Custom made in all ring sizes.